Brook trout are a native fish species to NY waters. Once plentiful in most of NY waterways the brook trouts habitat has shrunk considerably for various reasons including acid rains, habitat destruction, and introduction other fish species. 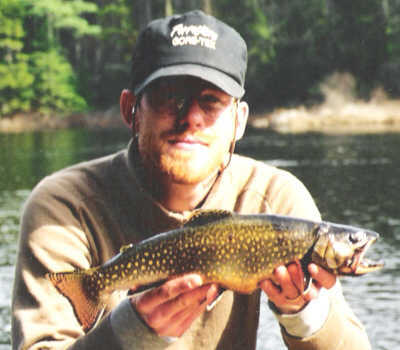 Brook trout are most often found in clean cool waters of the Adirondacks lakes and streams. They may be taken on taken artificial lures, worms, minnows, dry flies, nymphs and streamers. with fly rods or light spinning tackle. Brook trout can reach weights of 6 pounds or more but any fish over 2 pounds are very rare and are considered trophy status. Due to a lot of controversy the old records were tossed out and for a brook trout to be considered it must come from waters that have never been stocked with splake trout. A splake is a hybrid cross between a lake trout and a brook trout they are able to reproduce and grow much larger than plain old brookies. The state record splake weighed in at 13 lb. 8 oz.and was caught by Jonathan Simon on a Rapala from Limekiln Lake, in Herkimer County on June 27, 2004. The NY State record brook trout weighed in at 4 lb. 11 oz. and was caught by Richard O'Brien on a Worm & Spinner from the Ha-De-Ron-Dah Wilderness Area, Herkimer County on May 21, 2005. The brook trout was adopted as New York's official State fish 1975. Update The new record for Brook Trout is now 5 lb. 14 oz. This new record was caught by William Altman on May 5, 2012 while fishing in West Canada Wilderness Area in Hamilton County.The record breaking fish was stocked as a fingerling by DEC's Rome Fish Hatchery and is considered a Temiscamie hybrid, a cross between a domestic brook trout and a wild Temiscamie (Canadian-strain) brook trout. These hybrids are stocked because they have a better survival rate than other strains of brook trout in some of the more acidic waters of the Adirondacks.